Today, Compton born and bred rapper Buddy is back to share a new song and video. “Hey Up There” features Ty Dolla $ign follows “Trouble on Central” and “Black” featuring A$AP Ferg as the latest offering off of Buddy’s highly-anticipated debut album Harlan & Alondra. “Hey Up There” sees Buddy singing alongside Ty Dolla $ign, vowing to reach the lavish lifestyle that he’s always watched from afar. The new track is accompanied by a visual shot at the Compton airport and Tomorrow’s Aeronautical Museum that are across the street from where Buddy grew up, which played a big role in Buddy’s childhood imagination. The owner often gives back to the kids from the neighborhood and on one birthday growing up, Buddy received a flight lesson there from his mom as a gift. Harlan & Alondra is due out July 20th via Cool Lil Company / RCA Records and is available for pre-order now. The album places listeners in shotgun cruising through LA alongside Buddy while he discovers himself within the rugged fabric of the city. 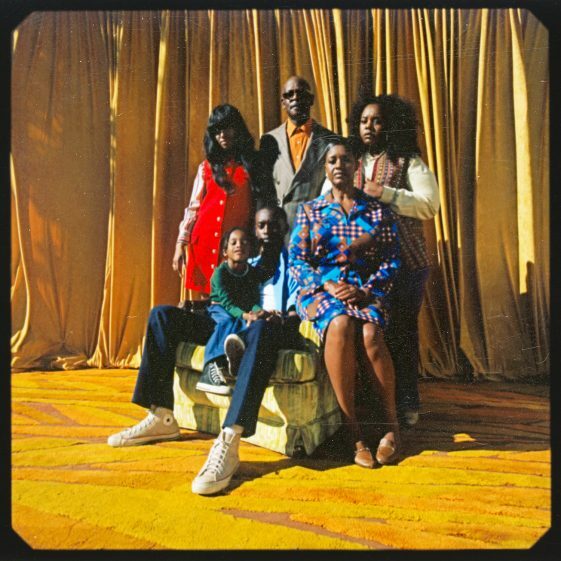 Scroll down to see the newly revealed cover art that centers in on the album’s theme of family by showcasing Buddy’s own family in a photo taken in front of his childhood home. In addition to the new song and album details, Buddy is announcing a run of tour dates with A$AP Ferg beginning in Portland, Oregon on July 7th and culminating in Boston, Massachusetts on July 27th. Scroll down to see the full routing. Buddy is also releasing a new merch collaboration with street wear brand Cactus Plant Flea Market and his own Cool Lil Company which can be found at www.coollilcompany.com. By the time Buddy was old enough to drive, he’d already been thrust into hip-hop’s fast lane. A rising rapper from Compton, California, he was discovered by Scott Vener, signed by Pharrell, and tapped for collaborations with Chance the Rapper and Kendrick Lamar. It was the kind of breakthrough most new artists dream of, but Buddy found himself restless, eager to get to work realizing his own artistic vision. In 2016, after years of industry groundwork, he summoned the courage to go his own way. Harlan & Alondra, his highly-anticipated debut album, is both a declaration of independence and a vivid reintroduction. It’s Buddy, invigorated, in his element, and on his own terms. Born Simmie Sims III, he grew up in churches where his father, a preacher, choir director and a recovering addict, introduced him to the uplifting power of gospel and soul. As he soaked up the sounds neighboring communities–from Compton to Long Beach, where he attended performing arts school–he observed the many interpretations of “the L.A. sound.” “I had friends in the ghetto and friends in the hills, and bounced around from school to school, so I watched all the phases–jerk music, ratchet era, gangbanger,” he says. “But they were very specific. I wanted to do something a little different.” The Los Angeles he sought to capture was bouncier and brighter, a colorful blend of jam-heavy funk, retro R&B, and chilled-out rap, strung together by his infectious optimism. “I wanted my music to sound like the sun,” he says.